Albert Thurlby Scoffins was born on October 1893, in Knipton. He was the son of John Edward Scoffins, a gardener (presumably to the Belvoir estate) and Fanny Elizabeth nee Hatton. He was one of 11 children – John Edward 1881–1945, Joseph W 1882–1936, William H 1885, Lucy A 1890, Florence 1892, Albert T 1893, Fanny E 1896, Louisa 1899 and Robert T 1901–1981. According to the 1911 census, in that year Albert was still living in Knipton, 17 years old, working as a Pony boy. The name Thurlby suggests a family connection with the Thurlby family of Helpringham, Lincolnshire. The connection is that Albert Scoffin’s maternal grand-mother was Mary Ann Parthina Thurlby, who came from Wigtoft, Lincolnshire. She married William Hatton, a footman from Donington near Boston, in Wigtoft on the 24th February, 1852, and by the time of the 1861 census the couple had three daughters, Mary Ann (b.1857), Fanny Elizabeth (b.1859) and Rosey (b.1861). Fanny Hatton went on to marry John Edward Scoffins at Grantham in 1880, and Albert Thurlby Scoffins was their sixth child. Mary Ann Thurlby had been recorded as being ‘of minor age’ at her wedding (<21), which tells us that she was born in or before 1831. She may well have been a sister of William Thurlby of Helpringham (b.1829), who was the grandfather of William Thurlby, who was also one of the ‘Bottesford men’ who served in WW1 and survived. Thus Albert Scoffins and William Thurlby may well have been second cousins, having grandparents that were respectively sister and brother. Unfortunately almost all the personal war records of Albert Thurlby Scoffins have not survived. According to the Medals records he was a Private in the Leicestershire Regiment and his service number was 203340. On the medals record it records his Theatre of War as 5WB first 7/a/317. There is a Silver Badge record for Albert Thurlby Scoffins which states that he enlisted on 10.10.1914 and was discharged on 30.5.1918. 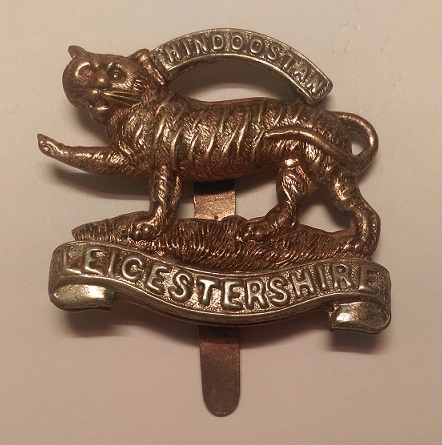 This indicates that he was wounded in service, and certainly the Leicestershire Regiment saw active service at the front line throughout the war. Confirmation of his war injuries is given in the 1933 obituary of his first wife Hester Agnes Louisa nee Fitzpatrick, where it states that “Mr Scoffins is an ex service man who was badly wounded while service with the 8th Battalion, Leicestershire Regiment in France” . To date no war pension records have been found. Details exist in the military record of his older brother John Edward who served in France in the machine gun corp. and, after becoming a casualty and suffering health problems, served back in the UK at Belton Park. We have not been able to find out why Albert Scoffins was on the ‘church list’ of Bottesford men who served and not his older brother. From his war medal record Albert was awarded the following: British War Medal, Victory Medal. He married Hester Fitzpatrick on 18th February 1918  some 3 months before his discharge from the army. They had five children: Robert G, Christine N 1923, Louisa F M 1926, Elizabeth 1927 & Lily 1930. Like many other wounded and injured servicemen, Albert fell on hard times. It was reported in the Grantham Journal in 1922 that he had made a false statement to the Melton Board guardians to obtain relief, having had previous assistance whilst obtaining unemployment benefit from the labour exchange. For this he was fined £1. Sadly Hester died in Melton Memorial hospital in 1933, aged 39 leaving him with young children. It would appear that there are two further marriages. The first in July/Aug/Sept 1939 to a Martha Nailor and the second a year later in Jan/Feb/Mar 1940 to Martha Wyatt but as yet no further details of either of these marriages has been found. Nottingham Evening Post 5th December 1944 article “Rail man Gaoled”.